Picture this: A race of people who are cast out by the mainstream because of the way they were born or look or their culture. Those who oppose their existence wish to use them for their own selfish ends, while others simply want them all dead. Among the oppressed number, there rise several factions of opposing views. One faction would like to show the rest of mankind that they are not to be feared and hated but simply wish to be left alone to live their lives as a part of society in peace and harmony. Those of an opposing viewpoint would like nothing more than to rise up and defend themselves against those who hate and fear them, shaking off the chains of oppression and marginalization by any means necessary. Unfortunately, there are many ethnic and racial minorities across the globe who have had an ongoing dialectic of the sort mentioned above amid their ranks. Some have had this argument for centuries. As an African-American male, I’m reminded of the ongoing discussions regarding the descendants of slaves in America and their struggle for inclusion as full members in the grand democratic experiment. Through all the pomp and fury, we simply wish to be left alone to live our lives without any more catch-22s like the prison industrial complex, poverty pimps, predatory lending practices, drug wars, demagoguery and a list of other things. 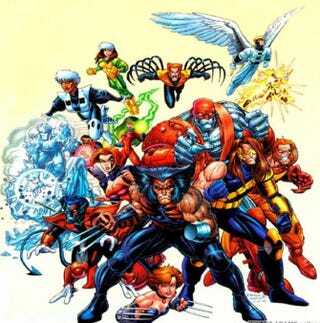 This all relates to the Marvel Universe of mutants born with a genetic trait called an X-gene. It allows them to develop superhuman abilities such as flight, matter manipulation, energy projection, telekinesis and teleportation, among other attributes. Because of these traits, many are hunted down and lynched simply for being born with the X-gene. The racism and hatred they faced in their fictional world is similar to that faced by African Americans. No idea is formed in a vacuum. For every film, television show, poem or, in this instance, comic book, the artists formed their creation by pulling inspiration from what they knew of the world. The X-Men and the concept of mutants were crafted by Stan Lee and Jack Kirby back in 1963 with the introduction of “X-Men” No. 1. I couldn't have everybody bitten by a radioactive spider or zapped with gamma rays, and it occurred to me that if I just said that they were mutants, it would make it easy. Then it occurred to me that instead of them just being heroes that everybody admired, what if I made other people fear and suspect and actually hate them because they were different? I loved that idea; it not only made them different, but it was a good metaphor for what was happening with the civil rights movement in the country at that time. The nonviolent philosophy incorporated by Dr. Martin Luther King Jr., as well as the self-improvement philosophy of Booker T. Washington, can be found in the X-Men’s teacher and benefactor Dr. Charles Xavier, affectionately known as Professor X. This is telling as well considering that followers of the Nation of Islam, effective players on the civil rights stage in the ’60s, used “X” to replace the American names with which they were born.